Legendary actor Marlon Brando has passed away at the age of 80 in a Los Angeles hospital on Thursday. The cause of death is still unknown. Adler has often been credited as the principal inspiration in Brando’s early career, and with opening the actor to great works of literature, music, and theater. While at the Actors' Studio, Brando adopted the "method approach," which emphasizes characters' motivations for actions. He made his Broadway debut in John Van Druten's sentimental I Remember Mama (1944). New York theater critics voted him Broadway's Most Promising Actor for his performance in Truckline Café (1946). In 1947, he played his greatest stage role, Stanley Kowalski—the brute who rapes his sister-in-law, the fragile Blanche du Bois—in Tennessee Williams's A Streetcar Named Desire. Hollywood beckoned to Brando, and he made his motion picture debut as a paraplegic World War II veteran in The Men (1950). Although he did not cooperate with the Hollywood publicity machine, he went on to play Kowalski in the 1951 film version of A Streetcar Named Desire, a popular and critical success that earned four Academy Awards. His next movie, Viva Zapata! (1952), with a script by John Steinbeck, traces Emiliano Zapata's rise from peasant to revolutionary to president of Mexico. Brando followed that with Julius Caesar and then The Wild One (1954), in which he played a motorcycle-gang leader in all his leather-jacketed glory. Next came his Academy Award-winning role as a longshoreman fighting the system in On the Waterfront, a hard-hitting look at New York City labor unions. During the rest of the decade, Brando's screen roles ranged from Napoleon Bonaparte in Désirée (1954), to Sky Masterson in 1955's Guys and Dolls, in which he sang and danced, to a Nazi soldier in The Young Lions (1958). From 1955 to 1958, movie exhibitors voted him one of the top 10 box-office draws in the nation. During the 1960s, however, his career had more downs than ups, especially after the MGM studio's disastrous 1962 remake of Mutiny on the Bounty, which failed to recoup even half of its enormous budget. Brando portrayed Fletcher Christian, Clark Gable's role in the 1935 original. Brando's excessive self-indulgence reached a pinnacle during the filming of this movie. He was criticized for his on-set tantrums and for trying to alter the script. Off the set, he had numerous affairs, ate too much, and distanced himself from the cast and crew. His contract for making the movie included $5,000 for every day the film went over its original schedule. He made $1.25 million when all was said and done. Brando's career was reborn in 1972 with his depiction of Mafia chieftain Don Corleone in Francis Ford Coppola’s The Godfather, a role for which he received the Academy Award for Best Actor. He turned down the Oscar, however, in protest of Hollywood's treatment of Native Americans. Brando himself did not appear at the awards show. To Read More of this In-depth Bio Click Here! 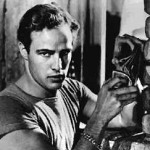 Brando's acting fits so perfectly into our discussion of "what is style?". His Stanley is seen as this mumbling, dirty, working class, "Method" slob and the height of literal realism in acting. In fact, Brando's Stanley is a masterful, completely theatrical creation built on a 100 genius level insights into human experience and behavior formed as acting choices that effortlessly and for all time embody the deepest reality of Williams himself -- ambiguity. It also happens to be acting itself -- living on stage under imaginary circumstances through utter belief in them. From Menegerie to Summer and Smoke to Streetcar to Cat to Sweet Bird, Tennessee built play after play on what he saw as the fundamental nature of human nature -- his REALITY -- ambiguity. Needless to say, sexuality was the loadstone of this alternately caressing and brutal worldview. Brando, more than any actor I have ever seen in Williams -- including Geraldine Page and Kim Stanley -- captured this ambiguity as Stanley. His Stanley moves with the grace of a panther, each action speaking volumes even as the voice masters and communicates through a brilliant New Orleans accent. Where Tennessee first saw a brute, Brando and Kazan saw a boy, both male and female. Stanley is as brutalized by his culture as Blanche herself -- that is their real "date from the beginning". In so many ways they are the same animal. Brando created all that. Every scratch, grunt, drop of sweat, muscle, look, action, feeling, inner line of action and movement sent off psychic waves of these realities. Surprisingly, if you truly watch and listen to Brando as Stanley you see one of the most refined and delicate -- almost classical in scope -- creations of character and the artistic and experiential embodiment of a play that the theatre has ever produced. Olivier may have been a great actor from the craft POV, but he never reached the ART of acting. Brando, right out of the gate, produced an utterly whole and complete example of acting as art. His Stanley was not an act of style audiences enjoyed; it was an experiential embodiment of a reality that effected their very beings and altered the culture -- that's art not just acting. If one studies Brando's Stanley, everything that acting and theatre can be is right there. He is the master class in acting. In post WWII actors, only Kim Stanley is his equal. Brando's death is the lost of a de Vinci. This is certainly a hallmark day in acting history! Brando, as an actor, died many years ago, and he spent his last years doing variations on old themes (he still did it better than most...but it was a faint echo of his glorious past). That we are able to see, and experience, his extraordinary gift through the films he's left behind, is a tremendous legacy, that will inspire actors forever. So, my thought is that, instead of grieve over a man who lived longer than, I'm sure, anybody expected, let's rejoice over the fact that he ever was...and the immortality he certainly has, in the hearts, minds, and video libraries of all who love great acting!